Due to diminishing resources and increasingly unreliable data, 2011 was the last edition of State Assistance Programs for SSI Recipients. We will continue to report optional state supplementation payment levels for federally administered states in our SSI Recipients by State and County publication. NOTE: These data are for the 50 states and the District of Columbia. 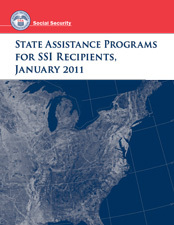 This report provides data on selected characteristics of state assistance programs for Supplemental Security Income (SSI) recipients as of January 1, 2011. The data the Social Security Administration (SSA) uses to compile this annual report are provided by a collaboration of federal and state sources. The data presented are what were made available at the time of publication. The programs covered in this report are state supplementation of federal SSI payments (mandatory and optional), state assistance for special needs, and Medicaid. The characteristics selected for each program are those that SSA receives questions about most often from individuals, public and private organizations, and federal and state agencies. The program details are explained in the "Guide to Reading the State Summaries." The report focuses on eligibility provisions and levels of assistance for individuals and couples by living arrangements, and those who receive supplementary payments in each state and in the District of Columbia. Payment levels shown are the maximum amounts possible for these living arrangements. The report also presents information about federal and state administrative responsibilities for making payments, state criteria for special needs payments, and Medicaid eligibility. Sherry Barber of the Division of SSI Statistics and Analysis collected and compiled the data. Staff of the Division of Information Resources edited the report and prepared the print and web versions for publication. The Office of Research, Evaluation, and Statistics gratefully acknowledges the cooperation of the state agency personnel and the Social Security Administration's central office policy analysts in providing this information.